What was your childhood like in Manila ? I was number 10 in a family of 11 kids. The constant smell of food is a very vivid memory for me. My parents came from a town on the outskirts of Manila. My grandparents had a rice paddy, a fishpond, and livestock. Everything was right in their back-yard. If you wanted chicken for dinner, you had to catch one and give it to Grandma so she could pluck it. Did you always want to be a chef ? When our family immigrated to Chicago in ’83, I wanted to find a job in food science, but it was difficult. Mom had a friend who worked at a hotel. I started there as a salad girl. And that was that ? Yes. When I walked in and saw my first chef wearing the white shoes and scarf, the tall hat, and the starched uniform, I thought, Where have you been all my life? What’s your family’s experience of food like today? My husband is also a chef, so our 14-year-old daughter has always eaten adult food. We took her to a tasting when she was four or five on her best double umbrella stroller, and she actually kept up with us. How did you wind up at the White House? There was a state dinner for Nelson Mandela during the Clinton administration. I was working at a D.C. restaurant called the Colonnade. They asked chefs in the neighborhood to help. 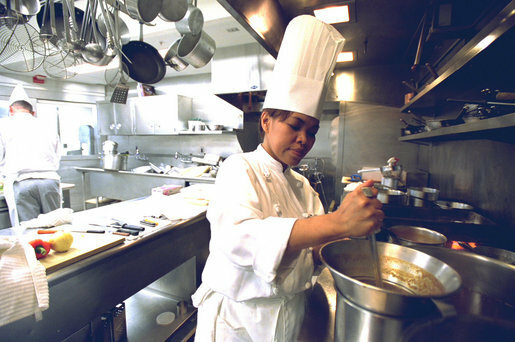 Then, in 1998, the White House’s chef brought me in as sous chef. 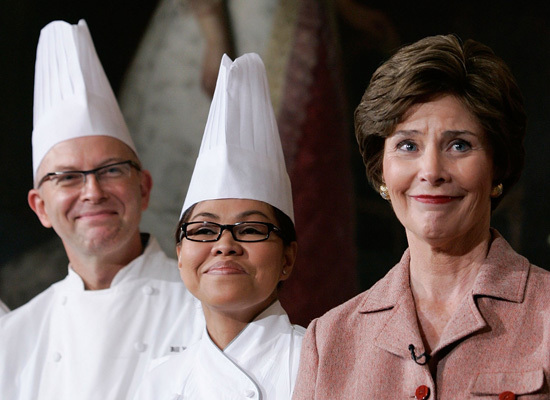 In 2005 the Bushes installed me as their executive chef. What was that moment like—finding out you got the job? Tell us about one of the toughest meals you’ve ever pulled off. Last year, at the Africa Leaders Summit, we had to cook for 50 heads of state. We had to accommodate all the dietary restrictions, practices, and preferences. It was a huge logistical challenge. How do you lead your team in a situation like that? I’m more of a coaching leader. You want to rally the people around you. You’re there to look at everyone’s talents and make sure you get the best of each team member. We have a lot of different ethnic backgrounds in the kitchen. The sous chefs have all these wonderful recipes in their heads. I always welcome everybody’s ideas. What’s your best time-management secret? I have an hour commute to work. It gives me time to plan, so I’m set to take care of the most important things first. As soon as I walk in the kitchen, I know what I’m going to do. We make sure our daughter is in bed by 9:30 at the latest. Within 10 minutes, my husband and I are conked out as well. I get up around 4:30. I do a little organizing so that when I leave, the bed is made and the house is clean. I also take a little quiet time in the morning. I have a Bible phone app that has a suggested daily reading that I like to use. Do you have time for exercise? We have a 50-pound poodle at home that needs a whole lot of walking in the morning. I try to do that at least four times a week. You take care of two families—the Obamas and your own. How do you do it? My husband stepped back from his executive-chef job to be a work-at-home dad. He’s a great support system. He makes sure our daughter is driven to practices and doctors’ appointments, and he does the cooking Monday to Friday. I take over on the weekends. He’s such a great partner. I couldn’t ask for more. What’s your advice to those aspiring to succeed in your field? What do the Obamas like to eat? The First Family loves fresh food and any-thing seasonal. In 2010 the First Lady installed a four-season garden. We use a lot of vegetables from there. It’s a beautiful resource. You just walk in the backyard and pick whatever you want. It’s almost like coming back home to my grandma’s place. Everything is right there.